I planned to watch my remaining Oscar contenders this week and make some informed choices. Not that it matters, we all know La La Land (2016) will sweep them – with merit. Instead, I went down memory lane again and compensated my dietary restrictions with food on (junk) film. Additionally, I found myself at a restaurant boasting an open kitchen, sat just across from the counter where all the orders I couldn’t eat were being readied. Awesome! Two diametrically opposed movies for MotW, because you don’t argue with nostalgia. Jumping down the artsy Berlinale ladder means dipping my toes into Oscar contenders and another Schwarzenegger classic. For a change, I have a hard time picking the movie of the week. I’ll go with Manchester by the Sea, because it hits so many right notes and the characters are pretty great and I’m pretentious, but at the antithesis of it I could have gone with John Wick: Chapter 2, a hell of an action romp with the character depth equal to Keanu’s acting chops. Playing catch-up here, this is a short review of the Berlinale movies. The opening film of the Berlinale competition is yet another take on the sufferings brought on by the second World War. 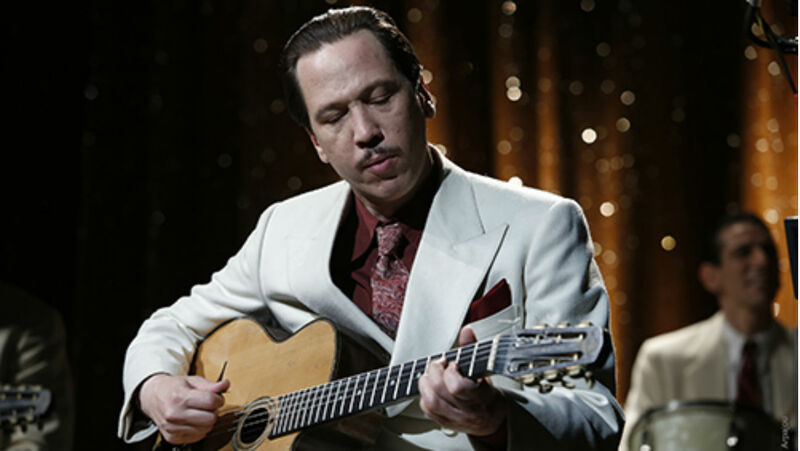 In a mixture of biopic and historical drama, Django fails in standing out from the crowd, walking down the one-dimensional route of escape from Nazi persecution, while rendering its characters secondary. Django Reinhardt, a guitarist of Romani ethnicity, is dazzling the crowds in Paris during the later days of the German occupation. The specter of deportation looms over his family, his band, yet he refuses to accept the idea that anyone would harm him, due to his positive notoriety. However, after declining to tour in Germany, a quick visit to a local police station makes him see the light, as he flees close to the Swiss border, awaiting transfer. There, he comes across a local Romani camp and they come together to perform music in the area, as a means for survival. That’s pretty much the gist of the story, which is as bland as it sounds. After a great opening scene, followed by an equally impressive musical performance, the movie drifts into this grey area where not much happens. Reda Kateb’s performance is strong enough to retain some interest, yet the production lingers without delving deeply into either Django’s person, nor the plight of the Romani people. Whenever music starts playing, the film comes to life, but this is not sufficient to keep a rhythm. It’s a shame, really, because there are glances of why Reinhardt could have been a relevant leading figure. Being unable to read or write, and bearing a childhood injury on his playing hand,his performances come from a deeply rooted passion for music, seemingly instilled by his Romani heritage and culture. This generates the contrast of music from the heart and music from the head, which is not subtle, yet it plays well with how ridiculously rigurous and lifeless Nazi censorship was. The close knit relations with his family, band and the fellow survivors he meets at the Swiss camp are well shaded against Reinhardt’s privileged position, and his sense of entitlement. Yet, there is no clear sense of inner conflict, although the movie does imply that his personal quest is to learn some self sacrifice, putting himself second. This is part of the problem, that Django just can’t set itself apart and come across without conviction. Supporting characters have little to no personality, and function as either plot enhancers, or easy to swap band members. Only the relationship between Reinhardt and his mother is distinguishing, even if it feels at times like comic relief. The generic portrayal of the Nazi oppressors doesn’t help either, as is the case with some of the elliptical moments in the story. Even the name of the movie should have given pause for thought: how does one make something distinctive with such an overused title? Django would have been a much better experience, had it stuck to its music, especially as some of the artist’s work was lost, which is a cause for grief. As another survival movie from the war, it falls flat, especially compared to some of the previously released hard-hitting productions, be they grim or soulful representations of the horror.